As the directorial debut of Jonah Hill, ‘Mid90s’ isn’t perfect, but it’s solid and enjoyable. 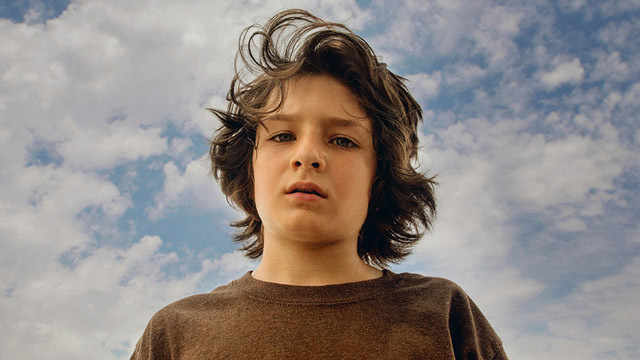 Bullied by his older brother Ian (Lucas Hedges), 13 year old Stevie (Sunny Suljic) manages to make friends with a gang of slightly older skater boys. They introduce Stevie to skating, drink, drugs and girls over a sun-soaked summer in LA. As the directorial debut of Jonah Hill, ‘Mid90s’ isn’t perfect, but it’s solid and enjoyable. It’s a coming-of-age story that doesn’t quite catch up to the benchmark of ‘Eighth Grade’, but Hill has a talented, charming lead in Sunny Suljic, who audiences might recognise from ‘The Killing of a Sacred Deer’. As Stevie’s brother and mother, Hill casts the also talented Lucas Hedges (who’s having a busy year between this, ‘Boy Erased’ and ‘Ben is Back’) and Katherine Waterston (‘Fantastic Beasts and Where to Find Them’, ‘Alien Covenant’). However the familial aspect of the movie feels underdeveloped. ‘Mid90s’ isn’t so much an examination of skater culture as a hangout or slacker movie a la ‘Dazed and Confused.’ Ray (Ray), Ruben (Gio Galicia) and the surreally named Fuckshit (Olan Prenatt) and Fourth Grade (Ryder McLaughlin) are great craic, with Gregg being the leader and Fuckshit, as his name suggests, being the mad one of the group. The fun feels most like a Jonah Hill movie when the group are just hanging out and chatting; their conversations are humorous and off the cuff, covering the kind of things you’d expect kids to talk about, like their families, would you rather games and racial stereotypes. Stevie is elated at being encouraged to pee out in the open and having his first experience with a girl. You’re invested in these characters and there are bittersweet as well as funny moments, such as Gregg’s heart to heart with Stevie. There’s a sense of nostalgia and innocence to ‘Mid90s’ that’s indicated even in its name. It harks back to a time when things were simpler, less complicated and political, when skating was the ultimate sign of rebellion and skaters breaking into prohibited areas was what we worried about. There’s also an infectious sense of joy in seeing these boys’ love of and commitment to the sport – one guy says “it’s amazing what pushing on a piece of wood does for the spirit”, which pretty much sums it up – as well as a tenderness to the story of a kid finding his place.